These highlights do not include all the information needed to use KYBELLA ® safely and effectively. See full prescribing information for KYBELLA ® . KYBELLA® (deoxycholic acid) injection is injected into subcutaneous fat tissue in the submental area using an area-adjusted dose of 2 mg/cm2. A single treatment consists of up to a maximum of 50 injections, 0.2 mL each (up to a total of 10 mL), spaced 1 cm apart. Up to 6 single treatments may be administered at intervals no less than 1 month apart. See General Considerations for Administration (2.2) and Injection Technique (2.3) before injection. KYBELLA® should be administered by a healthcare professional. Screen patients for other potential causes of submental convexity/fullness (e.g., thyromegaly and cervical lymphadenopathy). Give careful consideration to the use of KYBELLA® in patients with excessive skin laxity, prominent platysmal bands or other conditions for which reduction of submental fat may result in an aesthetically undesirable outcome. Use caution in patients who have had prior surgical or aesthetic treatment of the submental area. Changes in anatomy/landmarks or the presence of scar tissue may impact the ability to safely administer KYBELLA® or to obtain the desired aesthetic result. KYBELLA® is clear, colorless and free of particulate matter. Visually inspect KYBELLA® vials for particulate matter and/or discoloration, and discard the vial if the solution is discolored and/or contains particulate matter. After use, discard any remaining solution in the vial. The safe and effective use of KYBELLA® depends on the use of the correct number and locations for injections, proper needle placement, and administration techniques. Healthcare professionals administering KYBELLA® must understand the relevant submental anatomy and associated neuromuscular structures in the area involved and any alterations to the anatomy due to prior surgical or aesthetic procedures [see Warnings and Precautions (5)]. Needle placement with respect to the mandible is very important as it reduces the potential for injury to the marginal mandibular nerve, a motor branch of the facial nerve. Injury to the nerve presents as an asymmetrical smile due to paresis of lip depressor muscles [see Warnings and Precautions (5.1)]. Do not inject above the inferior border of the mandible. Do not inject within a region defined by a 1-1.5 cm line below the inferior border (from the angle of the mandible to the mentum). Inject KYBELLA® only within the target submental fat treatment area (see Figures 1 and 3). 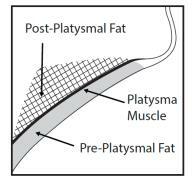 Prior to each treatment session, palpate the submental area to ensure sufficient submental fat and to identify subcutaneous fat between the dermis and platysma (pre-platysmal fat) within the target treatment area (Figure 2). The number of injections and the number of treatments should be tailored to the individual patient’s submental fat distribution and treatment goals. Use of ice/cold packs, topical and/or injectable local anesthesia (e.g., lidocaine) may enhance patient comfort. Outline the planned treatment area with a surgical pen and apply a 1 cm injection grid to mark the injection sites (Figures 2 and 3). Do not inject KYBELLA® outside the defined parameters [see Warnings and Precautions (5.1, 5.4)]. Using a large bore needle, draw 1 mL of KYBELLA® into a sterile 1 mL syringe and expel any air bubbles in the syringe barrel. Have the patient tense the platysma. Pinch the submental fat and, using a 30 gauge (or smaller) 0.5 inch needle, inject 0.2 mL of KYBELLA® into the pre-platysmal fat (see Figure 2) next to each of the marked injection sites by advancing the needle perpendicular to the skin. Injections that are too superficial (into the dermis) may result in skin ulceration and necrosis. Do not withdraw the needle from the subcutaneous fat during injection as this could increase the risk of intradermal exposure and potential skin ulceration and necrosis. Avoid injecting into the post-platysmal fat by injecting KYBELLA® into fat tissue at the depth of approximately mid-way into the subcutaneous fat layer (Figure 2). If at any time resistance is met as the needle is inserted, indicating the possibility of contact with fascial or nonfat tissue, the needle must be withdrawn to an appropriate depth before the injection is administered. Avoid injecting into other tissues such as the muscle, salivary glands and lymph nodes. Upon needle withdrawal, pressure may be applied to each injection site as necessary to minimize bleeding; an adhesive dressing may be applied. Injection: 10 mg/mL. KYBELLA® (deoxycholic acid) injection is a clear, colorless, sterile solution supplied in 2 mL vials intended for single patient use. Each milliliter of the solution contains 10 mg of deoxycholic acid. KYBELLA® (deoxycholic acid) injection is contraindicated in the presence of infection at the injection sites. Cases of marginal mandibular nerve injury, manifested as an asymmetric smile or facial muscle weakness (paresis), were reported during clinical trials. To avoid the potential for nerve injury, KYBELLA® (deoxycholic acid) injection should not be injected into or in close proximity to the marginal mandibular branch of the facial nerve. All marginal mandibular nerve injuries reported from the trials resolved spontaneously (range 1-298 days, median 44 days). Difficulty swallowing (dysphagia) occurred in clinical trials in the setting of administration site reactions, e.g., pain, swelling, and induration of the submental area. Cases of dysphagia spontaneously resolved (range 1-81 days, median 3 days). Subjects with current or prior history of dysphagia were excluded from clinical trials. Avoid use of KYBELLA® in these patients as current or prior history of dysphagia may exacerbate the condition. In clinical trials, 72% of subjects treated with KYBELLA® experienced injection site hematoma/bruising [see Adverse Reactions (6.1)]. KYBELLA® should be used with caution in patients with bleeding abnormalities or who are currently being treated with antiplatelet or anticoagulant therapy as excessive bleeding or bruising in the treatment area may occur. 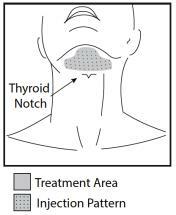 To avoid potential tissue damage, KYBELLA® should not be injected into or in close proximity (1-1.5 cm) to salivary glands, lymph nodes and muscles. Cases of injection site alopecia have been reported with the administration of KYBELLA®. The onset and duration of this adverse reaction may vary among individuals and may persist. Consider withholding subsequent treatments until resolution of the adverse reaction. Injections that are too superficial (into the dermis) may result in skin ulceration and necrosis [see Injection Technique (2.3)]. Cases of injection site ulceration and necrosis have been reported with the administration of KYBELLA®. Do not administer KYBELLA® into the affected area until complete resolution of the adverse reaction. In two double-blind, placebo-controlled clinical trials 513 subjects were treated with KYBELLA® (deoxycholic acid) injection and 506 subjects were treated with placebo. The population was 19-65 years old, 85% were women, 87% Caucasian, 8% African American. At baseline the population had a mean BMI of 29 kg/m2, moderate to severe submental convexity (graded as 2 or 3 on a 0 to 4 scale) and without excessive skin laxity. Subjects received up to 6 treatments at least 1 month apart and were followed for up to 6 months after the last received treatment. The most commonly reported adverse reactions are listed below (Table 1). Other adverse reactions associated with the use of KYBELLA® include: injection site hemorrhage, injection site discoloration, pre-syncope/syncope, lymphadenopathy, injection site urticaria, and neck pain. Adverse reactions that lasted more than 30 days and occurred in more than 10% of subjects were injection site numbness (42%), injection site edema/swelling (20%), injection site pain (16%), and injection site induration (13%). The following adverse reactions have been identified during post-approval use of KYBELLA®. Administration site conditions: injection site ulceration, necrosis and alopecia. There are no adequate and well-controlled studies of KYBELLA® (deoxycholic acid) injection in pregnant women to inform the drug-associated risk. The background risk of major birth defects and miscarriage for the indicated population is unknown. However, the background risk of major birth defects in the U.S. general population is 2-4% and of miscarriage is 15-20% of clinically recognized pregnancies. In animal reproduction studies, no fetal harm was observed with the subcutaneous administration of deoxycholic acid to rats during organogenesis at doses up to 5 times the maximum recommended human dose (MRHD) of 100 mg [see Data]. Embryofetal development studies have been performed in rats and rabbits using subcutaneous doses of deoxycholic acid administered during the period of organogenesis. For the basis of comparing animal to human doses, the MRHD is 1.7 mg/kg (100 mg/60 kg). No evidence of fetal harm was observed in rats at up to the highest dose tested (50 mg/kg) which is 5-fold higher than the MRHD of KYBELLA® based on a mg/m2 comparison. However, missing intermediate lung lobe was noted in rabbits at all dose levels tested including the lowest dose (10 mg/kg) which is 2-fold higher than the MRHD of KYBELLA® based on a mg/m2 comparison. These effects may be related to maternal toxicity, which was also seen at all dose levels tested. There is no information available on the presence of synthetic deoxycholic acid in human milk, the effects of the drug on the breastfed infant or the effects of the drug on milk production. The developmental and health benefits of breastfeeding should be considered along with the mother's clinical need for KYBELLA® and any potential adverse effects on the breastfed child from KYBELLA® or from the underlying maternal condition. Safety and effectiveness in patients below the age of 18 years have not been established and KYBELLA® is not intended for use in children or adolescents. The clinical trials of KYBELLA® did not include sufficient numbers of subjects aged 65 and over to determine whether they respond differently from younger subjects. Other reported clinical experience has not identified differences in responses between the elderly and younger patients. In general, dose selection for an elderly patient should be cautious, usually starting at the low end of the dosing range, reflecting the greater frequency of decreased hepatic, renal, or cardiac function, and of concomitant disease or other drug therapy. Injection of excessive doses/volumes of KYBELLA® (deoxycholic acid) injection may increase the risk of adverse reactions. Each 2 mL vial of KYBELLA® (deoxycholic acid) injection contains 20 mg synthetic deoxycholic acid as the active ingredient and the following inactive ingredients: benzyl alcohol (18 mg), dibasic sodium phosphate (2.84 mg), sodium chloride (8.76 mg), sodium hydroxide (2.86 mg) in water for injection, USP. Hydrochloric acid and additional sodium hydroxide are added as necessary to adjust the formulation to pH 8.3. Each vial is for single patient use. KYBELLA® (deoxycholic acid) injection is a cytolytic drug, which when injected into tissue physically destroys the cell membrane causing lysis. At therapeutic doses, KYBELLA® does not prolong the QTc interval. Endogenous deoxycholic acid plasma levels are highly variable within and between individuals; most of this natural bile component is sequestered in the enterohepatic circulation loop. Deoxycholic acid from KYBELLA® is rapidly absorbed following subcutaneous injection. After dosing with the maximum recommended single treatment dose with KYBELLA® (100 mg), maximum plasma concentrations (mean Cmax) were observed with a median Tmax of 18 minutes after injection. The mean (±SD) Cmax value was 1024 ± 304 ng/mL and was 3.2-fold higher than average Cmax values observed during a 24-hour baseline endogenous period in the absence of KYBELLA®. After maximum recommended single treatment dose (100 mg), mean (±SD) deoxycholic acid exposure (AUC0-24) was 7896 ± 2269 ng.hr/mL and was 1.6-fold higher over endogenous exposure. Post-treatment deoxycholic acid plasma levels returned to the endogenous range within 24 hours. No accumulation is expected with the proposed treatment frequency. Deoxycholic acid is extensively bound to proteins in plasma (98%). Endogenous deoxycholic acid is a product of cholesterol metabolism and is excreted intact in feces. Deoxycholic acid is not metabolized to any significant extent under normal conditions. Deoxycholic acid from KYBELLA® joins the endogenous bile acid pool in the enterohepatic circulation and is excreted along with the endogenous deoxycholic acid. Results from in vitro studies indicate that deoxycholic acid does not inhibit or induce human cytochrome P450 (CYP) enzymes at clinically relevant concentrations. Deoxycholic acid does not inhibit the following transporters: P-gp, BCRP, MRP4, MRP2, OATP1B1, OATP2B1, OATP1B3, OCT1, OCT2, OAT1, OAT3, NTCP, and ASBT. KYBELLA® has not been studied in subjects with hepatic impairment. Considering the intermittent dose frequency, the small dose administered that represents approximately 3% of the total bile acid pool, and the highly variable endogenous deoxycholic acid levels, the pharmacokinetics of deoxycholic acid following KYBELLA® injection is unlikely to be influenced by hepatic impairment. Deoxycholic acid pharmacokinetics were not influenced by gender. 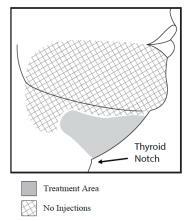 Long-term studies in animals have not been performed to evaluate the carcinogenic potential of KYBELLA® (deoxycholic acid) injection. KYBELLA® was negative in a battery of in vitro (Ames test and chromosomal aberration assay in human lymphocytes) and in vivo (rat erythrocyte micronucleus assay) genetic toxicology assays. No effects on fertility were observed in male and female rats administered deoxycholic acid at subcutaneous doses up to 50 mg/kg (5 times the MRHD based on a mg/m2 comparison) once weekly prior to and during the mating period and through gestation day 7 in female rats. Two randomized, multi-center, double-blind, placebo-controlled trials of identical design were conducted to evaluate KYBELLA® (deoxycholic acid) injection for use in improvement in the appearance of convexity or fullness associated with submental fat. The trials enrolled healthy adults (ages 19 to 65, BMI ≤ 40 kg/m2) with moderate or severe convexity or fullness associated with submental fat (i.e., grade 2 or 3 on 5-point grading scales, where 0 = none and 4 = extreme), as judged by both clinician and subject ratings. Subjects received up to 6 treatments with KYBELLA® (N=514, combined trials) or placebo (N=508, combined trials) at no less than 1 month intervals. Use of ice/cold packs, topical and/or injectable local anesthesia was allowed during the clinical trials. Injection volume was 0.2 mL per injection site, spaced 1 cm apart into the submental fat tissue, which is also expressed in dose per area as 2 mg/cm2. For each treatment session a maximum of 100 mg (10 mL) was permitted over the entire treatment area. Subjects were administered an average of 6.4 mL at the first treatment session, and subjects who received all six treatments were administered an average of 4.4 mL at the sixth treatment session. Fifty-nine percent of subjects received all six treatments. In these trials, the mean age was 49 years and the mean BMI was 29 kg/m2. Most of the subjects were women (85%) and Caucasian (87%). At baseline, 51% of the subjects had a clinician-rated submental fat severity rating of moderate and 49% had a severe submental fat rating. The co-primary efficacy assessments were based on at least 2-grade and at least 1-grade improvements in submental convexity or fullness on the composite of clinician-reported and patient-reported ratings of submental fat 12 weeks after final treatment. Additionally, changes in submental fat volume were evaluated in a subset of subjects (N=449, combined trials) using magnetic resonance imaging (MRI). Visual and emotional impacts of submental fat (happy, bothered, self-conscious, embarrassed, looking older or overweight) were also evaluated using a 6-question survey, with each question rated from 0 (not at all) to 10 (extremely/very much). Reductions in submental fat volume were observed more frequently in the KYBELLA® group compared to the placebo group as measured by the composite clinician and patient ratings (Table 2). The composite response rates by visit are presented in Figure 4. Note: Subjects were followed up 4, 12 and 24 weeks after the last treatment. Forty-one percent of subjects received fewer than 6 treatments and entered the post-treatment period earlier than Week 24. A greater proportion of KYBELLA®-treated subjects had at least a 10% reduction in submental fat volume as compared to placebo-treated subjects when evaluated by MRI (43% vs 5%, respectively). The overall patient-reported satisfaction and self-perceived visual attributes showed greater improvement in the KYBELLA® group than in the placebo group. KYBELLA® has a unique hologram on the vial label. If you do not see a hologram, do not use the product and call 1-800-678-1605. Each vial is for a single patient use. Do not dilute. Discard unused portion. Advise patients to contact their healthcare providers if patients begin to develop signs of marginal mandibular nerve paresis (e.g., asymmetric smile, facial muscle weakness), difficulty swallowing, or worsening of existing symptoms. Advise patients to contact their healthcare providers for development of open sore(s) or drainage from the treatment area. KYBELLA® and its design are registered trademarks of Kythera Biopharmaceuticals, Inc., an Allergan affiliate. It is not known if KYBELLA® is safe and effective in children under 18 years of age. It is not known if KYBELLA® is safe and effective for the treatment of fat outside of the submental area. are pregnant or plan to become pregnant. It is not known if KYBELLA® will harm your unborn baby. are breastfeeding or plan to breastfeed. It is not known if KYBELLA® passes into your breast milk. KYBELLA® is injected into the fat under your chin (up to 50 injections under your skin) by your healthcare provider. KYBELLA® injections will be given at least 1 month apart. You and your healthcare provider will decide how many treatments you need. Call your healthcare provider if you develop open sores or drainage from the treatment area. These are not all of the possible side effects of KYBELLA®. Call your doctor for medical advice about side effects. You may report side effects to FDA at 1-800-FDA-1088. General information about the safe and effective use of KYBELLA®. Medicines are sometimes prescribed for purposes other than those listed in a Patient Information leaflet. If you would like more information, talk to your healthcare provider. You can ask your pharmacist or healthcare provider for more information about KYBELLA® that is written for health professionals. What are the ingredients in KYBELLA®? Manufactured for: Allergan USA, Inc., Irvine, CA 92612. For more information about KYBELLA® go to www.mykybella.com.